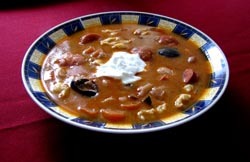 This sensational Hungarian bean soup is one of my favorite foods. I can eat three plates of it at once. Just try it out and I’m sure that you will want to share this recipe with your friends as well. If you decide to share this recipe, please ask your friends to visit this best-things-in-hungary.com site. 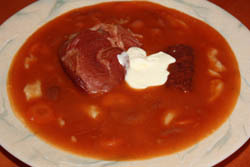 The name (Hungarian bean soup a la Jókai) was given after our famous Hungarian writer Mór Jókai as he was a big fan of this soup. This soup is so popular in Hungary, that a Hungarian beans soup cooking competition has been organized in 2005 on the 180th birthday of our writer. If you decide to cook this splendid soup, I recommend to reserve at least 3-4 hours of your time, as the preparation and cooking take quite long time. But I can guarantee it is worth one's while. 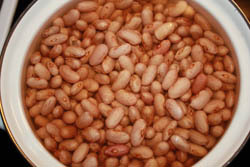 Soak your dried beans overnight. 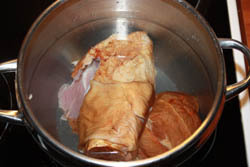 Make your meat stock: Cook smoked pig's feet and pork ribs in 1 and half liters (2 quarts) of water till the meat comes of the bones. Bone them and put meat pieces aside. If you want to save some time, I recommend doing this step the day before, and refrigerating the meat and the pork stock. There will be lot of accumulated fat on the surface of the stock. So if you do this step day before you will have the opportunity to skim more of the accumulated fat off. Take it seriously; there will be a lot of fat. 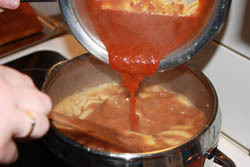 When you are ready to continue, heat the stock up again. Meanwhile, fry onion in oil over low heat. When onion is wilted, add chopped parsley and flour and make a brown roux over the lowest heat possible. Stir often to prevent burning. 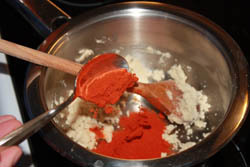 When the roux is light brown, mix in paprika and garlic; immediately add 1 cup cold water. Whip until smooth, and then pour into the cooked beans. Add smoked sausage and 1/2 tablespoon salt. Simmer for 10 minutes. Cut smoked meats into small pieces, and add to the soup. Adjust salt. Add the sour cream. Serve with Hungarian Galuska/ Little Pinched Dumplings. 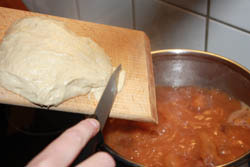 You can find the recipe for it on the page of the Hungarian Goulash recipe. Cook the Galuska in the soup, put the dumplings 7 minutes before the soup is ready. 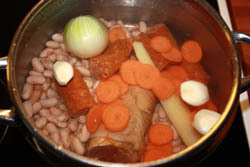 I hope you enjoyed the cooking of this traditional Hungarian bean soup a la Jókai. If you want to share your cooking story with me or you just need some help, please don’t hesitate to contact me.